I can’t go straight from writing a script to drawing the pictures. The scripts have to bake first. It depends. On a script that I know right out away is good, maybe half a day. Typically it’s about 24 hours. Howard Tayler is living his dream. His company, Tayler Corporation is planning to release a roleplaying game next year called Planet Mercenary RPG. He is part of an award winning podcasting group called “Writing Excuses.” If you visit his website at www.howardtayler.com you can read his yearly movie rankings (The Martian is currently his favorite of the year) along with reviews. You can also follow a link to buy his books, coins, t-shirts, mugs and a host of other branded merchandise. But, the engine that drives his company is the web comic at www.schlockmercenary.com. 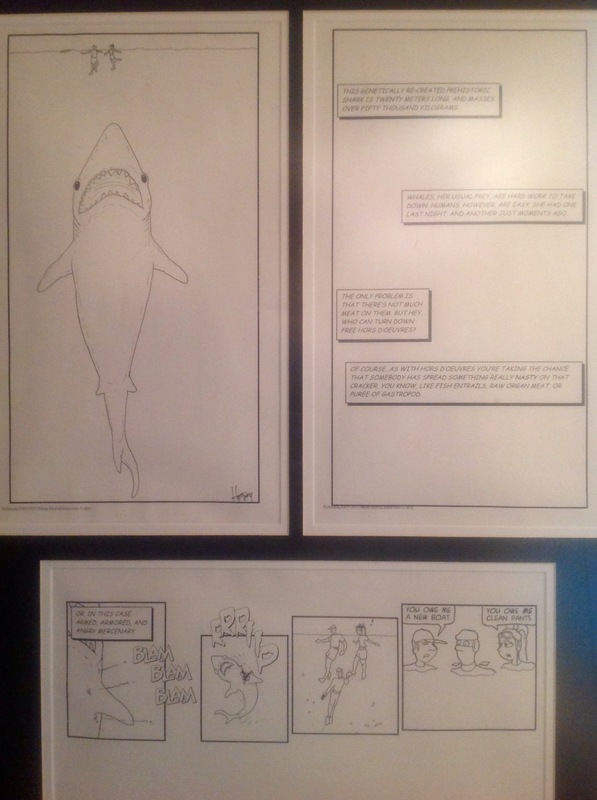 He’s been drawing and publishing his comic since June 12, 2000. (5,665 days without an interruption.) He used to have to balance his drawing with the demands of a full time job in the computer industry. But, since September 21st, 2004 he’s been a cartoonist full time. And he describes it as the best job in the world. 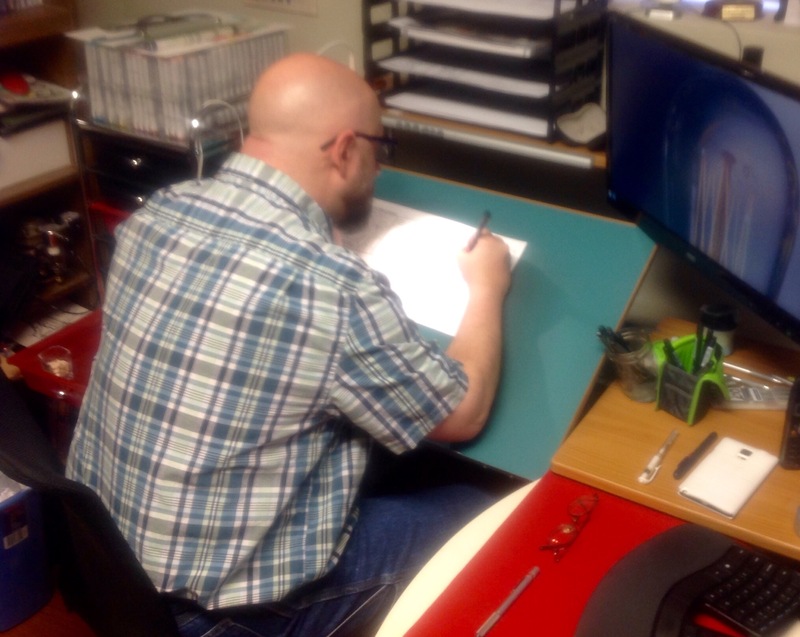 I had the opportunity to spend a couple of hours hanging out at Howard’s home office and he explained the process of creating a Schlock mercenary strip. The first step is writing. I didn’t show a picture of the writing process. It’s not very picture friendly. Howard writes the dialogue first. He typically can write a week’s worth of dialogue in a day. He has to allow the bake time as mentioned above. Many entertainers are at heart, writers. I used to think I was a comic who wrote his own material. Later, I realized I was a writer who delivered his material on stage. Every strip begins with a basic template From here, Howard arranges the panels and plots the physical layout of the day’s strip. 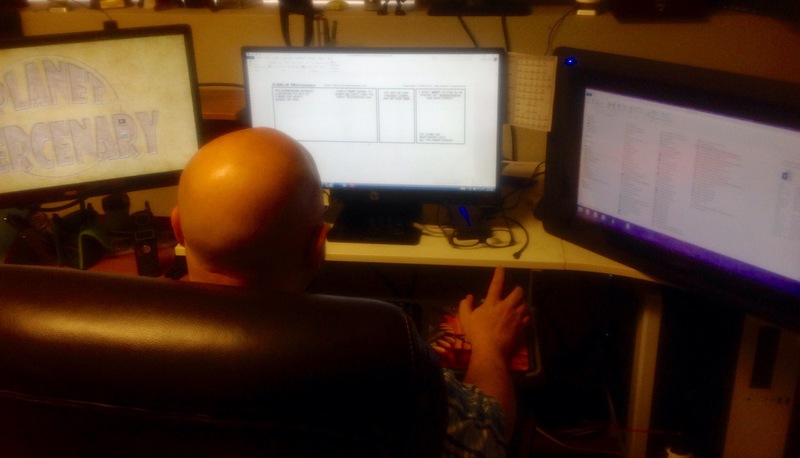 After deciding on the physical layout, he adds the now baked script to the blank panels. 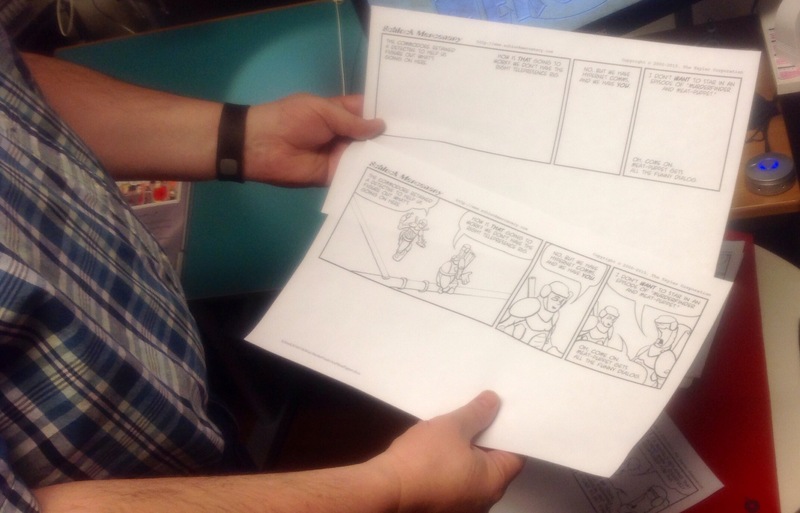 The pages with dialogue but no pictures are then printed out on legal sized (11×14 inch) paper. Here he is showing a before and after. But, there are still a couple of steps to get from the words sheet to the picture one. Pictures are first drawn in pencil. This step is, not surprisingly called “penciling.” Many people might consider this the “real” part of creating the comic. 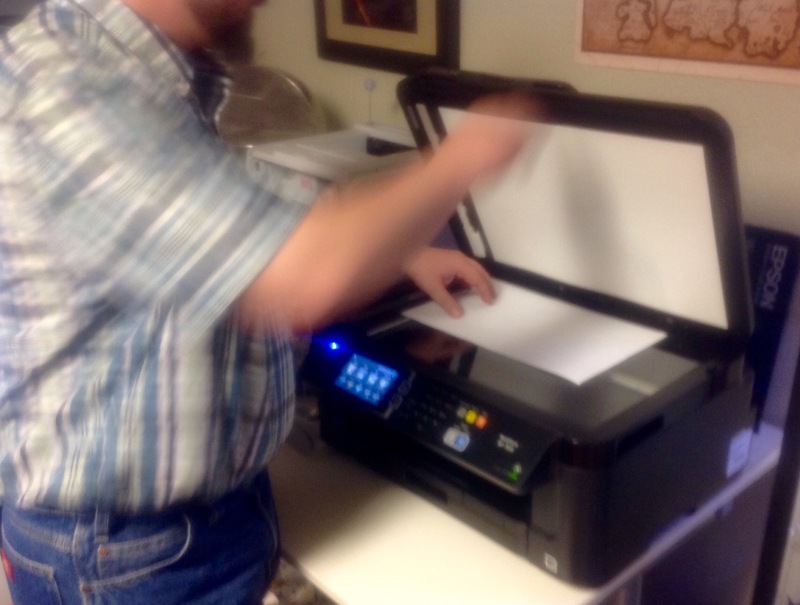 It’s where the visual images transfer from Howard’s head to paper. Pencils are still temporary. After the penciling it’s time to “lay down some ink.” Howard explained that he normally will put on a NetFlix video during the inking. The creative parts are finished by this point. It’s simply a matter of making the images permanent. Penciling and inking a week’s worth of comics takes about two days. I remember several years ago, visiting Howard when he drew at Dragon’s Keep, a game store in Provo, Ut. He was inking some strips. Or, I should say he was attempting to. It quickly became obvious that I was distracting him. I excused myself and he got back to work uninterrupted. During our recent interview he inked seemingly effortlessly while we talked. Either he’s gotten a lot better at inking or I’m a lot less distracting. We should move on. I didn’t get a picture of the bottle of White Out, but that is an essential tool in the artist’s tool chest. Once he’s satisfied with the inking, it’s time for the coloring. 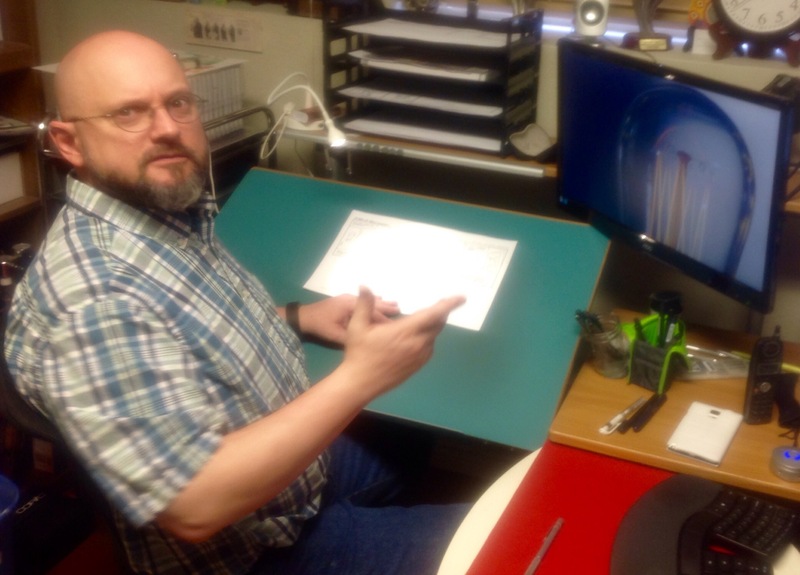 Howard scans the completed strip and sends it to Travis Walton, the Schlock colorist. Interestingly at this point the hard copy pages, the pulp of dead trees that he drew on, are no longer necessary to the process. Howard has been known to sell them. 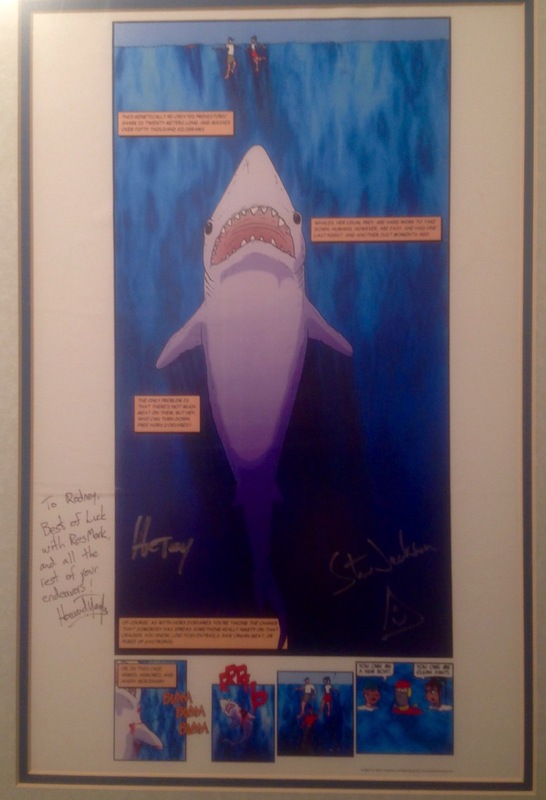 I have these original pages from the Mega Shark story framed and hanging in my office. Howard later released it as a poster. The framed inks and the poster hang side-by-side in my office. 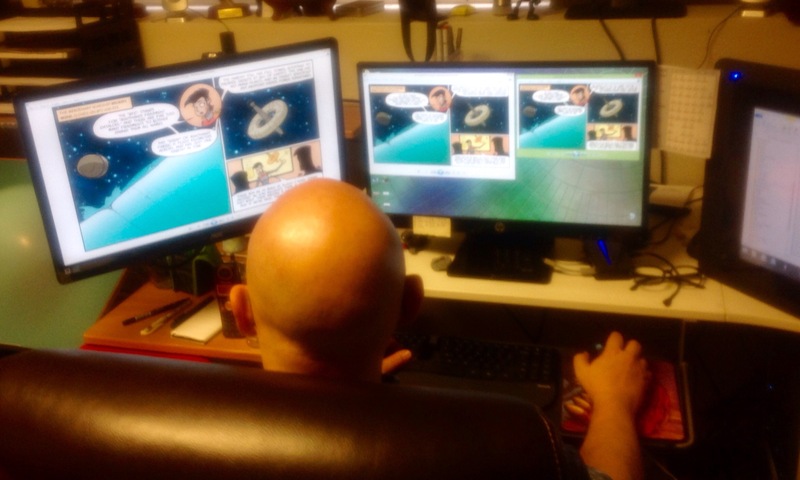 After Travis completes the coloring, Howard creates three version of each image, visible here on his monitors. There’s a Retina version, for iPads, an iPhone version, and the “grid” or web version. Much of the process is automated as each file is saved in its correct format and file type with a unique name, into a specific directory. At the appropriate time the files are pushed to the various platforms for Schlock fans to enjoy. It’s a very complex process that is made to look very easy by a man who’s been doing it for 15 years. 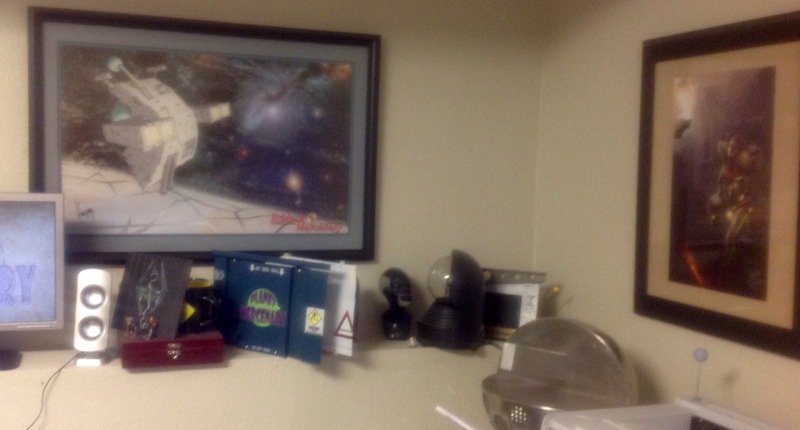 What would a tour be without showing you some of the interesting collectibles that he’s gathered over the years? 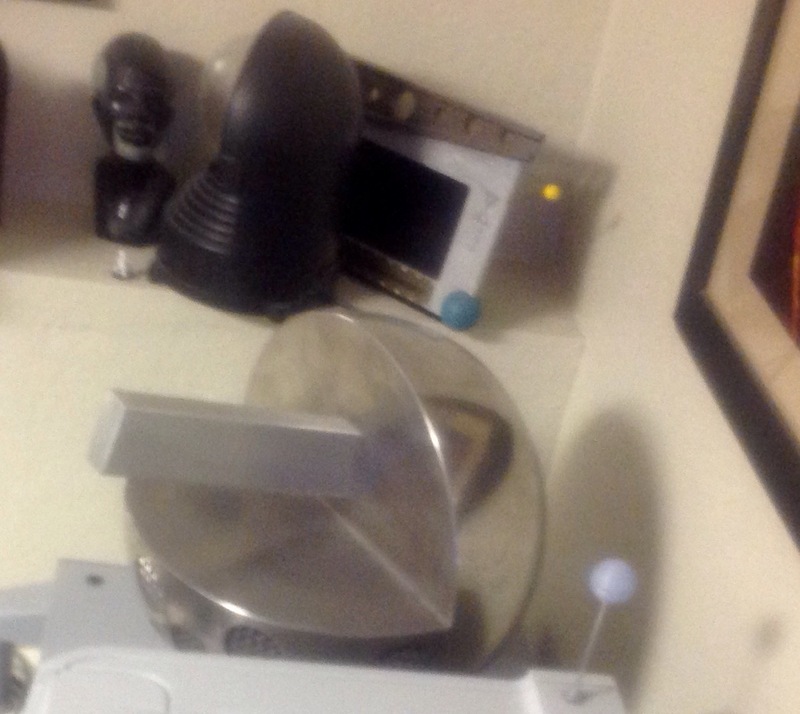 Howard’s office includes several interesting bits and collections. In one corner is the life size plasma cannon. The walls are covered with framed book covers. 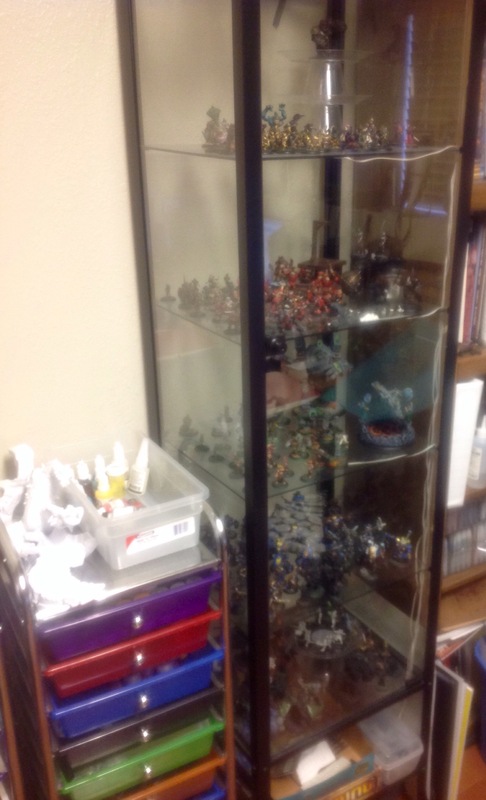 A table and two class cabinets are dedicated to miniatures. I meant to ask you about miniatures. I wasn’t sure if you were still painting them. You haven’t mentioned them recently online. 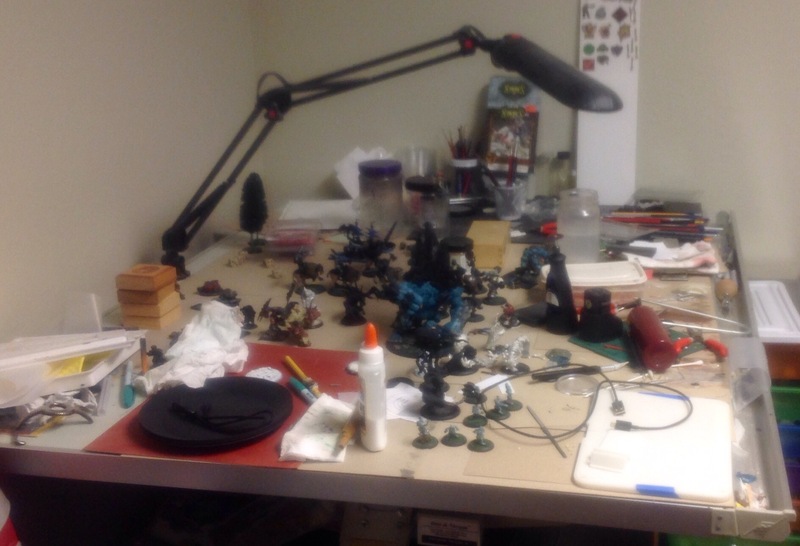 The Planet Mercenary work has taken the time that painting miniatures used to fill. Doesn’t that mean replacing a hobby with a work task? Not really. But, even if it did, the PM stuff has an end date. 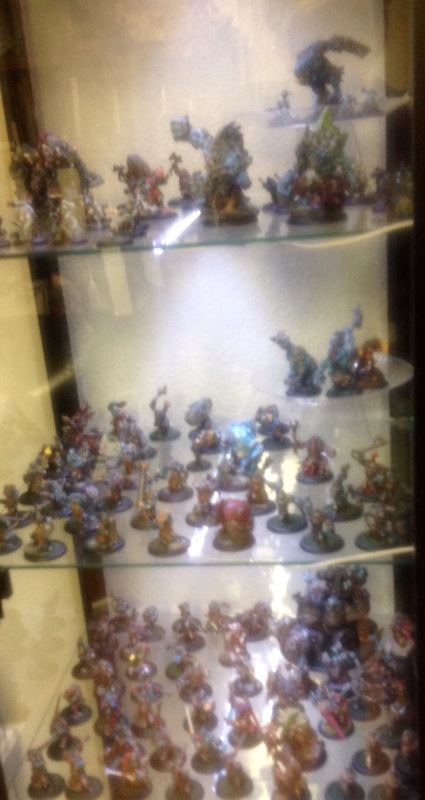 I would love to have time to paint miniatures. And I’ll gladly return to it when the game is done. 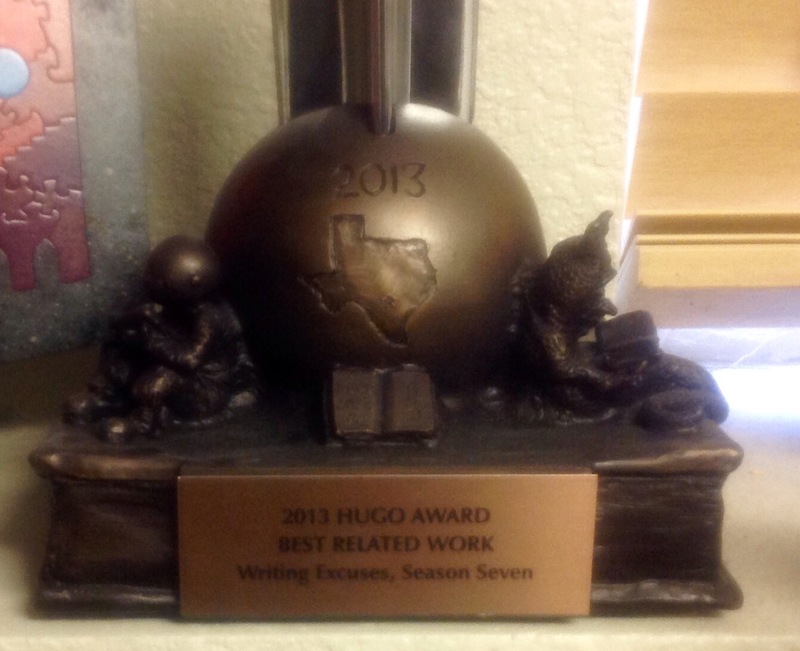 And of course, the Hugo award that he won for Season Seven of Writing Excuses has a prominent place. 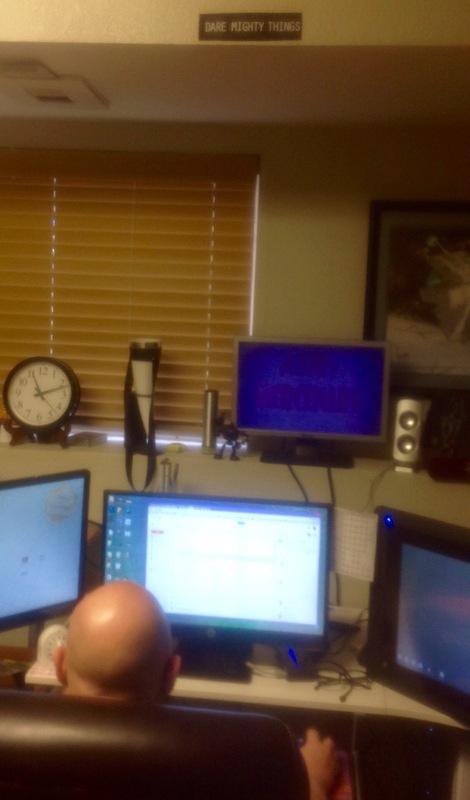 I didn’t notice the sign above his desk until I was just about to leave. I think it’s clear that Howard has taken the advice “Dare Mighty Things” to heart. Schlock fans are glad he did. This is the third of a five part series on Schlock Mercenary.